This is a review for the supplement Vaxa Attend. The manufacturer claims that this supplement will support attention difficulties. Read on to learn more about this product and whether or not it is the ideal choice for you. Lithium Carbonicum 9C 12C 30C HPUS- Works to decrease tension and brain fog. Naturum Muriaticum 9C 12C 30C HPUS- Works to decrease depression symptoms and increase nutritive functioning. Agaricus Muscarius 9C 12C 30C HPUS- Works to decrease ticks and improve controls of nerves. Argentum Nitricum 9C 12C 30C HPUS- Works to decrease feelings of nervousness and inferiority and improve memory. Fluoricum Acidum 9C 12C 30C HPUS- Works to clear mind and increase focus. Hyoscyamus Niger 9C 12C 30C HPUS- Works to decrease impulsivities, depression and paranoia. Iodium 9C 12C 30C HPUS- Works to calm the mind and body. Please note: This product is gluten-free. Teens and adults are to take three capsules twice a day for 30-45 days. After that, two to four capsules should be taken daily. Physician may also recommend a dosage appropriate for you. Children who less than 50 pounds are to take a total of two capsules daily, in the morning and in the afternoon, for 30-45 days. If no effects are felt, the dosage can be increased to 4 capsules daily, in the morning and in the afternoon. Children who are more than 50 pounds are to take a total four capsules daily, in the morning and in the afternoon, for 30-45 days. After that, the dosage can be decreased to two capsules daily, in the morning and in the afternoon. It was recommended that Attend be taken at least 20 minutes prior to or following a meal. This product costs $40.69 for a bottle. Each bottle contains 60 capsules, which is approximately a 30-day supply. The manufacturer offers a 90-day guarantee on homeopathic products. What this means is that if you are not satisfied with the product, you have up to 90 days to return it for a full refund. This is good for those who end up purchasing this product and find that they do not like the results. There are no customer reviews or testimonials available on the manufacturer’s website, so it is unclear if this product has worked for users. 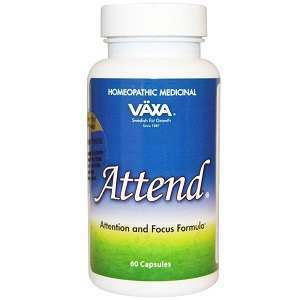 Vaxa Attend is said to support those who have difficulties paying attention. With there being a lack of customer reviews on the manufacturer’s website, it is unclear as to whether or not this product has worked for those who have tried it. Customers may find both the affordable price and the 90-day guarantee an incentive for purchasing this product because they have three months to try to the product and decide if they want to continue use. If they do find that they are not satisfied, they have time to return the product for a full refund. Overall, Vaxa Attend seems like a good product and could be the ideal choice for you depending on what you are looking for. Henry Costa	reviewed Vaxa Attend	on June 14th	 and gave it a rating of 3.